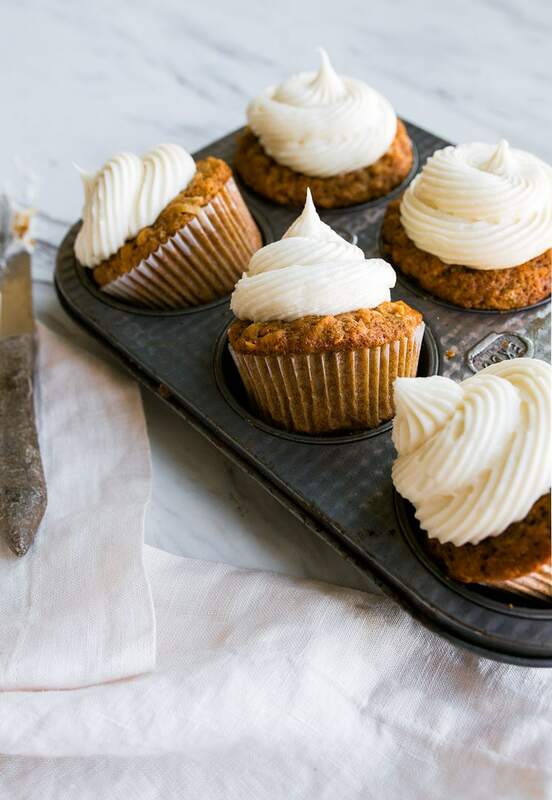 Carrot Cake Cupcakes with Cream Cheese Frosting (small batch recipe makes 6 cupcakes). It’s carrot cake season, and my family couldn’t be happier! Carrot cake was one of the layers of my wedding cake, because my husband loves carrot cake. Camille seems to love it too, but honestly, toddlers love any kind of cake—especially if it has swirly frosting. 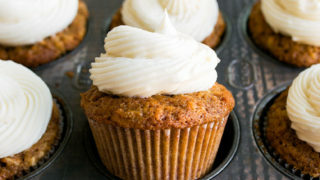 I love carrot cake almost as much as my family, but I really love it in cupcake form. When the carrot cake cravings hit, I sometimes turn to my small carrot cake recipe that is made in a 8×8″ pan with caramel cream cheese frosting. It’s easily one of the most popular recipes on this site, and all of the reviews I’ve received about it have been glowing! I actually stuck the recipe in my Sweet & Simple: Desserts for Two cookbook, because it’s so much easier than making a regular 3-layer carrot cake! That cookbook is all about simple, easy-to-make desserts for two, if you’re interested, by the way. If you’re looking to keep things a little healthier and naturally-sweetened, I made a version of sugar free carrot cake a few years ago that is sweetened with apple juice and pineapple. I call it ‘Carrot Cake, Naturally.’ I shared it during sugar-free week. Would you guys be up for another sugar-free week? Bikini season is fast approaching, isn’t it? Let’s quickly move the subject back to the finer things in life, like cream cheese frosting and cupcakes, shall we? 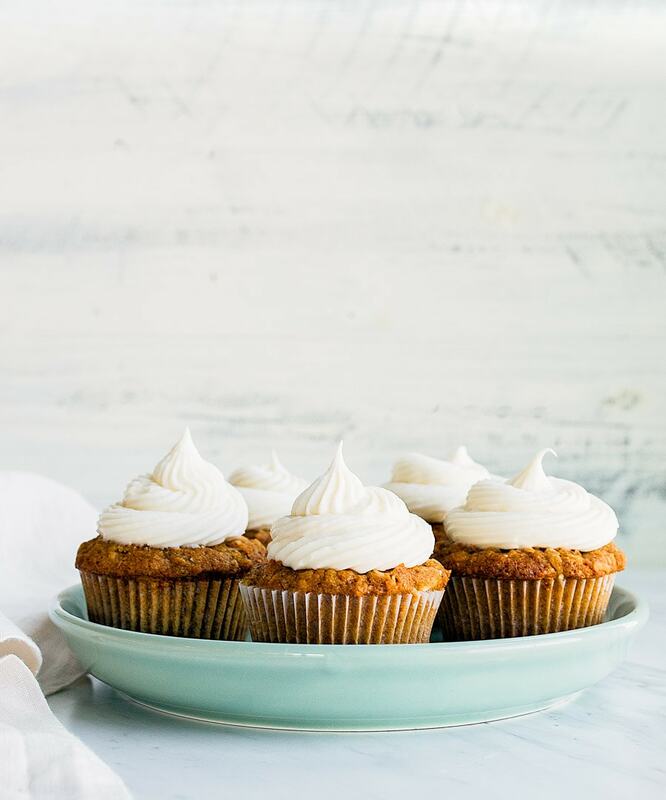 This recipe for carrot cake cupcakes makes just 6 cupcakes, which I love because carrot cake is something I have a hard time resisting. I think it’s because I justify each bite since carrots are a vegetable? 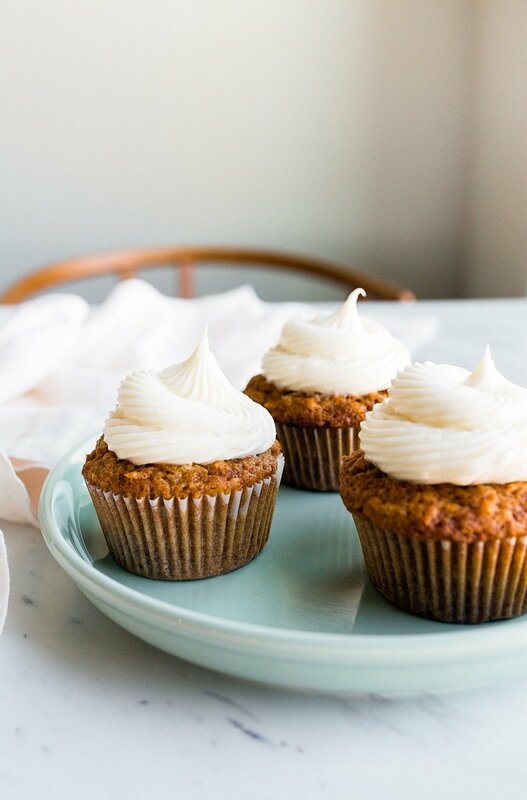 There are 2 carrots in this small batch of carrot cake cupcakes, so technically, you’re eating 1/3 of a carrot with each cupcake. 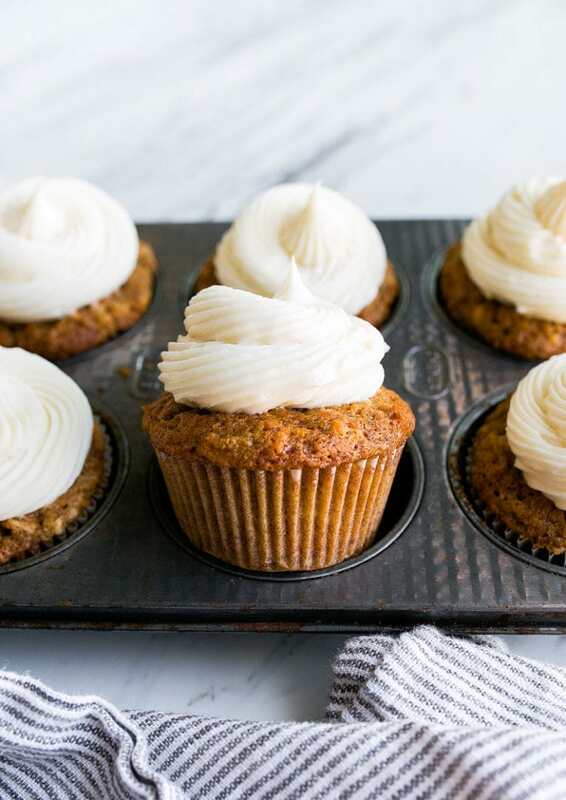 The cream cheese frosting recipe makes juuuuuuust enough frosting to frost all 6 cupcakes, but not a drop less, ok? I know that some of you like to double my cupcake recipes and bake them in small 6″ cake pans, and I wanted to let you know that you’ll have to double the frosting recipe, too. First, preheat the oven to 350, and line a muffin pan with 6 cupcake liners. In a large bowl, whisk together the flour, cinnamon, cloves, nutmeg, ginger, baking powder, baking soda, and salt. Whisk very well. Add the grated carrots and coconut, and whisk very well to combine. 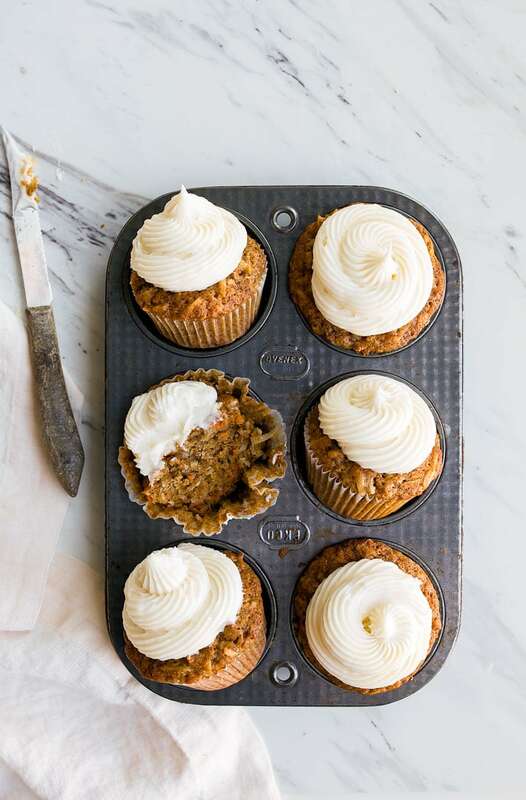 The flour coats the carrot and coconut pieces and helps them not sink to the bottom of the cupcakes. In a separate bowl, whisk together the brown sugar, egg, sour cream, vanilla and oil. Combine the wet and dry ingredients, and stir just until blended. Divide the mixture between the cupcake liners, and bake for 24-27 minutes, or until a toothpick inserted comes out clean with only moist crumbs clinging to it. Let the cupcakes cool completely. Let the cream cheese and butter soften on the counter in the meantime. To make the frosting: beat together the cream cheese, butter, powdered sugar, and vanilla until light and fluffy. Frost the cupcakes with a knife, or place the frosting in a piping bag fitting with a tip and frost them. The cupcakes keep for up to 3 days, refrigerated. Let them rest on the counter about 20 minutes before serving. Apparently, I am going to be up late making cupcakes tonight. These look amazing. I’m very excited to try out this recipe! I’m wondering if I wanted to make mini cupcake sized (using a mini muffin pan) do you have any recommendations or guesses for baking time? I’m not a big fan of coconut – can I leave this out? I have made every one of your carrot cakes, because somewhere along our 16 year relationship, my bf decided carrot cake is one of his favorites. Each time we inhale and say there can’t be a better recipe. Well, we just inhaled this cake because you are queen and guide us with such amazing recipes! THANK YOU! Good luck at your book signing tomorrow! I was just wondering if could I use Greek yogurt instead of sour cream? would it mess up the entire thing? Can this be made without the coconut? Do I need to add anything in to make up for it? Hi! Can’t wait to try these! My question: most folk in these parts want/expect to have crushed pineapple in their carrot cake cupcakes. How much crushed/drained pineapple would you suggest adding if one were to do so? I was thinking about 1/2 cup? Many thanks! What would you suggest as a dairy free alternative to the sour cream? I made this today for my picky,vegetarian daughter and she licked the paper liner, lol. This is a very nice, easy dessert. Thank you do much! Made these for the 4th. Absolutely perfect and so flavorful. I used to be only a big batch baker (and still freeze a lot of cookie dough), but as my nest has emptied this is so much more practical. These are not short cut recipes, but the real seal scaled down. Thanks so much. This one is a keeper! Do you think its possible to make this into a small cake? What size pan should I use/how to adjust the baking time? Thanks. I have made these twice, and they are SO GOOD! It’s nice to find a good recipe for a small batch. I’ve also successfully doubled this to make 12 cupcakes. FYI I left the coconut out because I didn’t have any, and it’s still delicious. The frosting is perfect – I find it makes plenty for the cupcakes, with a little bit left over. Thank you for this perfect recipe!!! So, I can assure you it was a glitch in my nutrition calculator. It’s not actually possible to cram 3000 calories into a single cupcake. It’s fixed now, and each cupcake has 504 calories. However, I’m not a medical doctor, so use a nutritional calculator online that you like and double check before eating.